Chief Minister Uva Province Chamara Dasanayake told the media yesterday afternoon at his office that it was absolutely a false allegation that he threatened and forced a principal of a Tamil girls’ school in Badulla to kneel down before him. He said that he received complaints that the principal concerned being a Hindu had discriminated the students of other faiths and that he called her to his official residence to inquire into the complaint in the presence of the Secretary to the Provincial Ministry of Education, Director of Education and the parents who made the complaint. “I only requested the principal to be cautious of acts that could disturb communal harmony and after a friendly discussion we could settle the dispute amicably. After the meeting the principal and the parent saluted me in the oriental fashion and left. However, the JVP Provincial Councillor Samantha Vidyarathana has resorted to a false propaganda from the political platform to tarnish my image. I will take legal action against him,” he said. Meanwhile, the Principal R. Bhavani who refused the allegation levelled against the Chief Minister, confirmed his version of the story. The cat is out of the bag. Now the principal must be dead scared of losing her job hence will say anything to please the politico. You're right she is scared out of her wits, and also may be she had been given "something" to play along. The Principal threaten, she knows that her life is in danger and nobody can save her. Well !!! politicians ever accept their misdoing? if so this country would have being a best country in the world. Sirisena gave cheif organiser pist for such traitor last minth.so others also doing such crimes to be get promoted. You can't call official resident. This must end. I hope minister will do the correct thing. this bugger is a politician, simply would have threten the principal. Now whom to trust. Not only politicians but now it seems news RAJA is also giving one sided information to fool the people. After all its all contract based. he can white wash himself in one of these 2 ways 1. Threaten the principle2. giving her a hefty sum of money. What was the reason to call her to his residence? If an official matter, he could have summoned her to his office? Isn't that smells something fishy??? It is not the business of the CM to involve in such matters and of course not in his private residence. Is it appropriate for the Lady Principal to be at the CM's House??!!! Doesn't he have an office? ?Why couldn't this meeting be held at the school?? Another thug. He is not fit to be a CM. I am pretty sure the ministers in the present Government is Educated fellows and will not put up with this rubbish. If he has done it he must say sorry. These are the GURUS who is going to produce good educated people for Mother Lanka.Please get rid of him soon as possible. This is only happenning is SL. 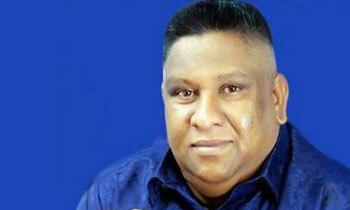 Srilankan Polititians are babarians. We can believe him as much as we believe RK and now RW also.